The four Slovakian men blasted Polka and shared their gallon of red wine when we joined them in their blue work van on the way to Olomouc. They jovially shouted questions we couldn’t answer and comments we couldn’t understand. The mid-40’s driver, prominent nose and permanent grin, demanded we try Slovakian chocolate. Two twenty-somethings and the classic skinny-as-a-rail and moustachioed older man delighted in miming questions. My new Slovakian friend, mug of wine, and Slovakian chocolate! How did we end up a part of such a hilarious scene? Hitchhiking! It took a lot of guts to give it a try, what with the potential for rejection. I’ve hitched rides to fetch a vehicle on past rafting trips. And in New Zealand, Pat and I hitched from our friend’s house to the library ten or eleven times. But never have I stood on the road with all my belongings hoping to catch a lift. People who hitch regularly love it, and now I know why! It’s a priceless way to meet locals and be part of their lives. Between Prague and Litomysl, we met Jakob – 30, laborer, recently married, just became a father – who taught us about how the Czech Republic has changed in the last 20 years. Like Walmart’s U.S. take-over twenty years ago, Tesco is just now showing up in small towns and killing small businesses. Next Jara (Yah-rda) offered us a ride to Litomysl. Fancy businessman and father of two, he shared his hearty laugh and problems Czech families are having with “latch key kids” – children and teens left unsupervised for hours because their parents are having to work long hours to make ends meet. 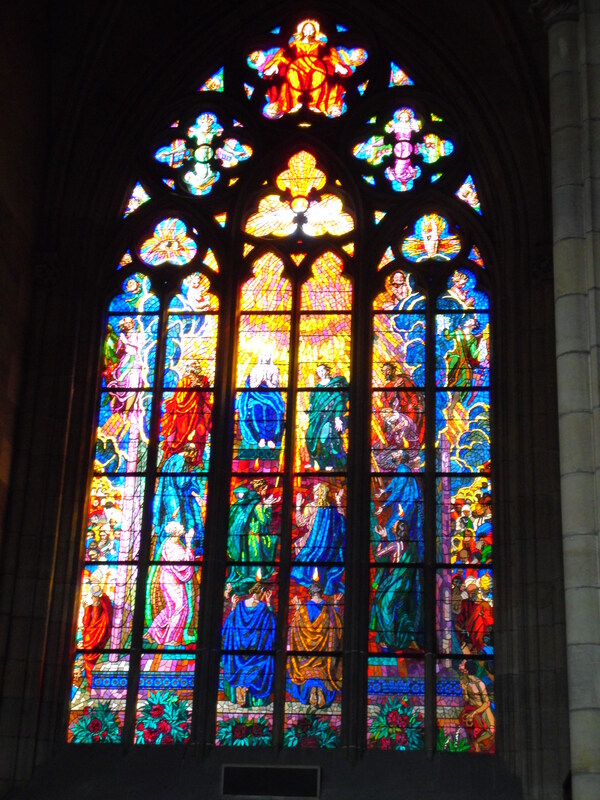 Gorgeous stained glass in Prague Castle's iconic cathedral. So far, we are loving the Czech Republic. 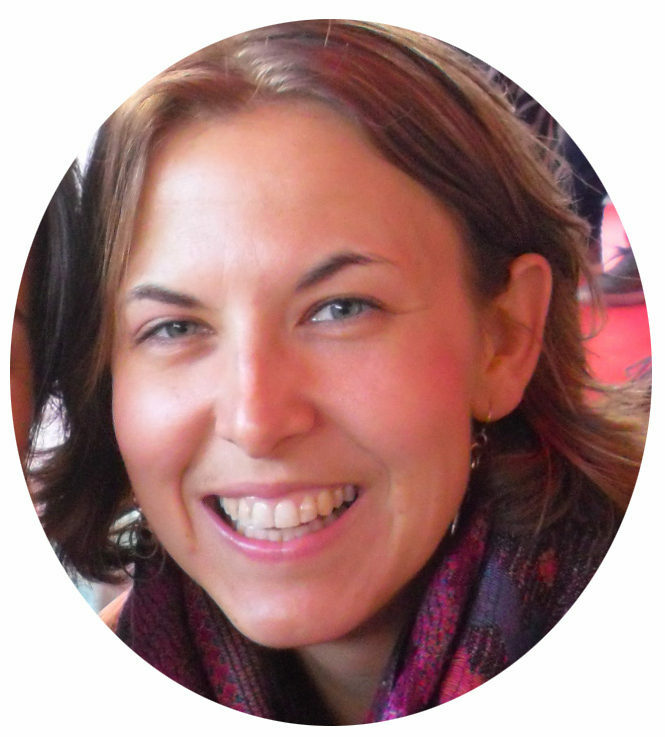 We started in Prague, couchsurfing with Martin – an awesome lawyer with a sharp eye for design. He lives in Brno with his husband half the week, and works in Prague the other half. Martin is also a history genius who taught us, among other things, why buildings have been multistory since the middle ages: citizens wanted to live inside the city wall once it was built. To make room, the only way to go was up! We’ve spent hours admiring the stunning accumulation of history in these areas. In Prague, of course the castle overlooking the river can be seen almost anywhere. Cobble stone streets and five-floor buildings full of arched and embellished windows dominate the scene. The colors are soft, muted yellow, latte brown, mylanta grey, and pale olive peeking out from above and behind leafy trees flourishing in the chilly spring sunshine. Outside the city center the history and pomp above remains, while the street level building surfaces sport signs of reality – graffiti marking every other building. 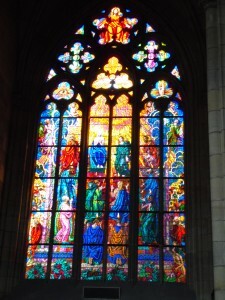 Churches are everywhere, despite the Czech Republic’s reputation as a mostly atheist nation. I love the gothic and baroque cathedrals. The former are gaudy, cold, austere, with lots of gold, while the latter are warm, soft, the rich colors of desert sunsets, with pastel murals and more subtle gold. The atomic clock on Prague's Old Town square. 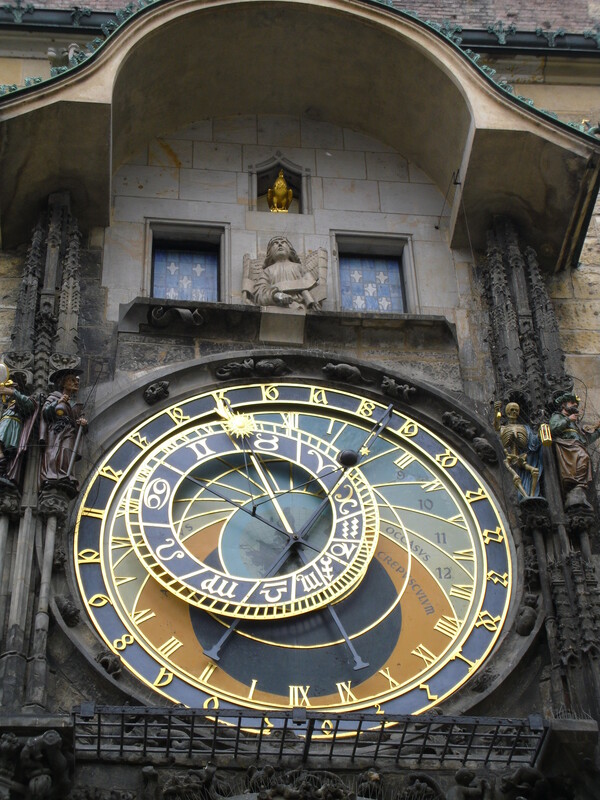 The lively, fun commercial scene in old town Prague is full of glass and crystal shops for which Bohemia – the old name for this area of the world – is famous. In front of fountains, statues, and the atomic clock, old women and children feed bread to birds. Crowds stare in the windows of the rock candy shop watching the miracle of a huge, fat tube of sugar being hand-rolled and stretched into tiny pieces of candy with intricate designs. After we had our fill of the city, Martin took us up to the Tomb of the Unknown Solider overlooking the night lights. We talked about the Czech corruption, which all citizens we’ve met feel is depressingly rampant. In the morning, we talked ourselves into and out of trying hitching several times before we found ourselves on the side of the highway at Cerny Most hopping into Jakob’s work van. The countryside felt like medieval farmland – every color of green represented, with dark trees dotting the hills and waterways. 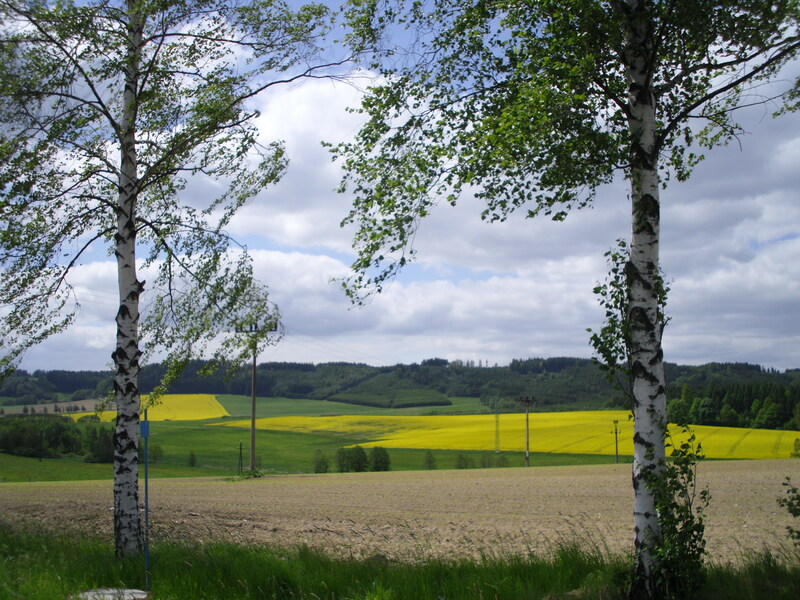 The vivid yellow blooms of a crop grown for its seed-oil blanketed several fields. We often felt like we were in Minnesota! Or Oregon! Many of houses in the villages we passed through reminded me a bit of the historic districts in small, U.S. towns. 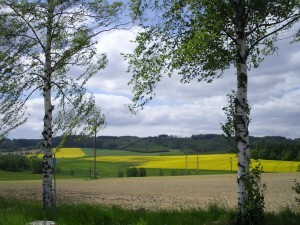 The gorgeous spring-time countryside full of yellow fields blooming to eventually produce oil. In the tiny village of Litomysl, the lovely info center kept our bags as we wandered the historic square, picnicked in the gorgeous monastery gardens, and oooh’d and ahhh’d at the castle. Thanks to the aforementioned Slovakians, we met our couchsurfing host Jiri (Yeerd-ee) on the cobblestones in front of the Olomouc (Oh-loh-moats) town hall right at 5 o’clock! His fiance, Mary (Mah-dee) joined us for dinner at the pub where we tried local cheese, famous Czech beer, classic Czech duck, potato pancakes, and cabbage. That night, after the U.S. lost to Finland in the last six seconds of the Hockey World Championships, the Czech Republic beat favored Sweden! We watched from Jiri and Mary’s living room on the edge of our seats. 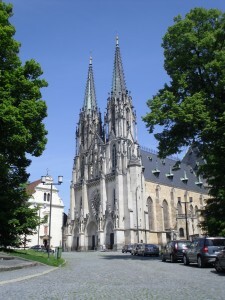 We picnic'd in front of this 700 year old church in Olomouc! Stunning European architecture and snapshots of new friends are in this photo album. *Kent is played with four people on two teams. It’s a game of deception and strategy. Each player holds four cards and is ultimately trying to obtain four-of-a-kind. Four cards are laid face up in the middle of the group. Players can swap cards in their hand with cards in the center at will and at very high speeds. When no player desires any of the cards left in the center, they are replaced with four new cards. While all the swapping and accumulating is going on, it’s very important to watch the other players. Your partner will secretly signal you when she or he has four of kind, at which time you shout “Kent!” to win a point. However, if your competitors see the signal or suspect you have four-of-a-kind and shout “Stop!” before you say “Kent,” they win the point. So ensues wild swapping, suspicion and hilarity. We played for over an hour!